I haven't touched base in a while, so I thought I'd let you know what's going on in my neck o' the woods. I'm just about finished with Badge's sequel, which is called Nineteen Ways to Destroy Your Rock Band. This one currently clocks in at 101,000 words, about 25% longer than Badge. These things just keep getting longer. I hope to put the finishing touches on it by the end of the year, or early 2018. Don't expect it anytime soon, but know that I'm working on it and it's coming. 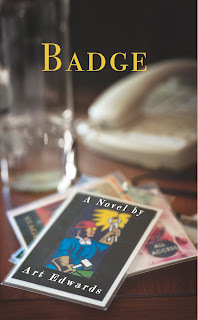 Also, I still have about 40 copies of Badge that were bought with the funds from its Kickstarter campaign. I'm currently selling these for the low, low price of $5.00 apiece at my website. That's the best price you'll find anywhere. Finally, I've had a couple of nonfiction pieces appear in the last year or so that may interest you. The first is about the effects of a certain Georgia band on my fragile 18-year-old psyche. Read “A Portrait of the Artist as a Young R.E.M. Fan” at Bull. Also, you can read about the process that took my story “Waiting for the Question” past the one and only Alex Trebek before it was published in Forest Avenue Press's City of Weird anthology last year. Read my essay “Waiting for the Answer” here, published by Necessary Fiction. I think that's it. Please feel free to reach out to me if the mood strikes. I'm always around. Labels: Badge, City of Weird, Nineteen Ways, R.E.M.